The women sat on the right side of the room with only coffee and water. My plate, full of corn is in the foreground. Last week, I sat on the floor of a community hall watching 12 men devour full plates of steamed corn, sweet potatoes, and bananas, washing down their mouthfuls with swigs of black coffee. The women who had graciously served this food sat on the other side of the room, watching their husbands, brothers or neighbors eat and quieting their own bellies with nothing more than gritty coffee. I felt a knot growing in my stomach. We were holding a meeting to assess a project to train farmers in sustainable production methods, a collaboration between the UN World Food Program and the local government in a rural village in Nusa Tenggara Barat province, Indonesia. Throughout the meeting, the only woman who spoke was the richest woman in the village. She had participated in the trainings, she was married to a local politician, and they owned several hectares of land. The rest of the women spoke only when I addressed them directly, and even then they giggled and hid their faces with the excess cloth from their hijabs (the traditional Muslim head covering). On the other side of the room, the men lunched on corn, sweet potatoes and bananas, as my coworker (left) took notes. When the meeting was over, the women would take what food the men had left on the plates to divide among themselves in the kitchen. 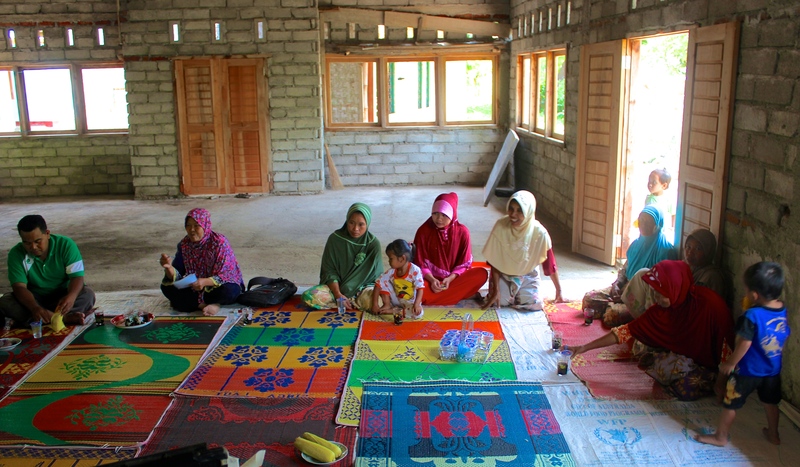 Gender inequality in Indonesia is borne out in people’s diets. It is one of the reasons that the World Food Program operates here. We ran a program on this very island providing nutrient-rich supplemental foods to pregnant and lactating women, because they especially don’t get enough of the nutrients that babies need to thrive. It affects their children, leading to high rates of stunting and malnutrition. I wanted to stop the meeting and say, “Hey, why aren’t the women eating? Lets share!” I probably could have, but I didn’t. I tried my best to get them to speak, addressing my questions—in my limited Indonesian—directly to them. (We often hold separate meetings with women and with men, so that each side feels more comfortable speaking, but on this day we did not have the time or staff to do so.) The fact that I was asking the women their opinion was clearly making everyone uncomfortable. I felt like if I pointed out the fact that men ate while women did not would be culturally insensitive for the situation. Who was I to challenge the structure of their community? Though I sat on the female side of the room, I was served a plate of my own. I’m a woman, but I’m a foreigner, my skin is lighter and I speak English, so I fall outside of all their cultural paradigms. Still, I wondered if these women think I bow my head and serve my husband dinner every night. They watched me break the rules, eating before men do, speaking directly (and thus impolitely). Do they think I come from a place where gender no longer affects status? Do they know that in my world, I am also not equal to my male peers? That I am likely to earn less than my male peers for the same work? That even in America, a white female senator from New York has to put up with sexual harassment from her male colleagues? I felt that pointing out the gender inequality before me was on the one hand hypocritical, and on the other hand, my responsibility. Of course this is not the first time I’ve seen firsthand the painful differences between the lives of women and men in a developing country. But that sick feeling in my stomach is there every time, from South America to Africa to Asia, and I struggle for the best way to handle these situations, knowing that this inequality is not something I must correct for them, but for myself too. Sitting in the community hall, I couldn’t eat the food in front of me while the rest of the women had only coffee. I looked at my male co-worker eating heartily alongside the other men in the room, and I realized he had never noticed that the women would not eat (he expressed surprise when I pointed it out to him later). As the male leaders closed the meeting with a prayer, I thought of Sheryl Sandberg, who argues that women will be better off when more women are in power, and that women need to “sit at the table” and participate to affect their world. These women were not at the same table, literally; they needed someone in power to even notice that they were not eating! Most of the problems I see in rural villages where WFP works will be solved by reducing poverty. But gender-based inequality, the poverty of women compared to men, cuts across all income levels. The problem persists in my own community, even among the leaders, and the wealthiest. It is holding back Western society just as it is holding back this village. Two girls buy apem, a tasty snack, in the middle of a busy sidewalk in central Jakarta. If you have noticed the long lull between posts on this blog, you are simply watching what happens after about a year of living in a foreign country. What was once a surprising and obvious topic for a blog has become so expected and commonplace that sometimes I nearly forget it is worth writing about. The call of the mosques at 6 p.m.; a family of 6 packed onto a motorcycle; and co-workers eating rice with their fingers in the office lunchroom are all just everyday experiences. But as we have become more accustomed to the peculiarities of Jakarta life, we have also gotten a more in-depth view, and we hope that means we can share a deeper look at Indonesian culture from our perspective. One of the features of Jakarta that most irked me when I arrived was the near non-existence of public spaces. What this means is that public life has to happen in some very awkward places. For example, if there is no sidewalk, waiting for the buss just happens on the road. If there are no parks, then meeting up after work just happens on the sidewalk, where there is one. When I first arrived I found these gatherings rather irritating. I felt like there must have been a more appropriate place for them. After over a year, they have become one of my favorite elements of Indonesian culture. Like many of Indonesia’s problems the lack of public space is the result of a history of dictatorship, where a very small few benefited most from the countries riches. In a deliberate bid to eliminate gathering spaces for public dissent, Suharto eliminated public spaces. This was doubly beneficial to the dictator and his cronies who profited from selling would-be public land to developers who built malls, hotels or office towers that could turn a profit. Construction in the city was allowed to proceed with little consideration for those who could not pay. For example, buildings all have drive-up entrances but lack a walkway to the entrance (as though only those who travel by car should bother arriving at all). In addition, sidewalks are few, and those that exist are either too narrow for the volume of foot traffic they receive or they are blocked by numerous obstacles, like poles, stairways, overpasses, or treacherous holes right into open sewers. The lack of public space is a tragedy. For 99.9 percent of Indonesians who don’t have a car and can’t afford to meet friends to eat in a mall, the city is unaccommodating by design. What is beautiful is that Indonesians don’t let this get in their way. They gather wherever they can. At the end of the work day, food carts take over the sidewalks; customers stand, or sit on plastic stools. One popular type of lunch-time food court simply takes over a full lane of a road for the legth of about a block. The nickname for such places – “amigos,” an abbreviation of agak mingir got sedikit – means “just next to the sewer a bit.” In the midst of the heat and the smog, the street, the sidewalk, or the roadside become the spaces of public life. Here, in a city of more than 20 million people with little public space to speak of, you have to take what space you can get. A boy fans the flames for the sate he sells under the staircase of a pedestrian overpass. This food cart is tucked into a lane that has been claimed for motorcycle parking. Coworkers begin to gather after work for a quick bite. Today my Indonesian language teacher showed up for our lesson wearing a blue and red checkered shirt, typical of the supporters of the newly elected president Joko Widodo (known by his nickname, Jokowi). Today, it seems like the wait is finally over. After three months of tense quiet since the election (and the results made clear), Jokowi was finally inaugurated. On the day the election results were announced, I expected a jubilant uproar around the city, which would have matched the excitement of Jokowi’s campaign. But his opponent, Prabowo Subianto, an ex-military general who was backed by big business and linked to the county’s history of dictatorships, swore to contest the election results in the constitutional court. So instead of holding victorious announcements and parades, Indonesians seemed to wait with bated breath. Over the next month, the constitutional court reviewed the evidence and declared (as we all suspected) that the election had been acceptably fair and Jokowi was in fact the true winner. Still, no celebrations were held. Prabowo stormed out of the court building, vowing to continue his quest to ruin his opponent. Over the next two months, Prabowo and his cronies continued attempts to thwart the growth of popular democracy. First they tried to block Joko’s resignation from his current post as governor of Jakarta, Indonesia’s capital city. The attempt caused some turmoil but eventually failed. Then the Prabowo camp managed to land a real blow to the growing sense of democratic power. With a majority in parliament, they passed a bill in the last moments of the standing congressional session eliminating public elections for mayors, district chiefs and provincial governors. Only 10 years after Indonesians began popularly electing presidents, they may have lost the right to elect local leaders (who would instead be chosen by central leadership). Prabowo and his backers were only setting the stage for a fight that promises to last throughout Joko’s presidency. Prabowo’s “red and white” coalition holds the majority of parlimentary seats, and they have already overturned the practice of giving speakership to the largest party (Joko’s); instead, they held a vote and kept speakership on Prabowo’s side. No wonder progressive Indonesians who voted for Jokowi have kept their voices low. They know they are taking on a monolith of power with a vested interest in maintaining the status quo of centralization, corruption and undemocratic processes. They weren’t going to take to the streets until they were sure their president would be inaugurated. Today, that day has come. Unfortunately, the fight is far from over. Parallels to Obama’s election in 2008 abound. Jokowi does not come from the elite group of the country’s most recent leaders. He is from a slum in central Java, and began his career as a furniture maker. He rose up as governor of Solo in central Java and was later elected governor of Jakarta, despite fierce opposition. He is known for his unplanned visits to project sites and public areas, and he relied on broad-based fundraising. But I can only hope he and his followers are less naïve than we Americans were when we elected Obama. 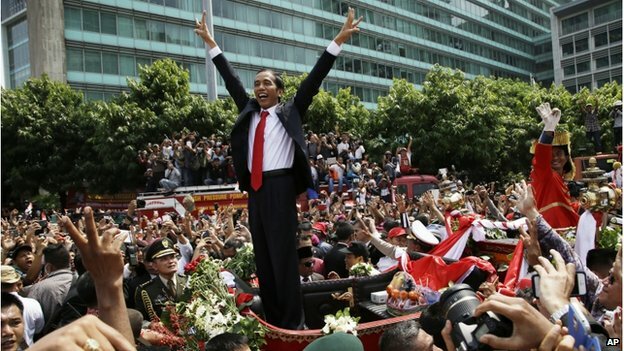 Finally for the first time since the campaign, the energy behind Jokowi is palpable again. A stage was set up in central Jakarta where the new President is expected to sing along with his favorite heavy metal bands after dark. Millions of people have already filled the streets today. Their silence over the past few months suggests they are more realistic than their American friends about the challenges their president will face. But today, they get their turn to party. Watching the 2014 presidential campaign in Indonesia is sometimes like watching a bad movie’s overwrought metaphor for the tension between democracy and authoritarianism playing out in real life. The choices have narrowed since I last described the presidential candidates, and on July 9, Indonesians will choose either the young populist Jakarta Mayor Joko Widodo (aka Jokowi) or the ex-military general, human-rights-violator and billionaire Prabowo Subianto. The campaigns seems to be about image, not issues. As I’ve written before, Indonesians do not learn about the Nazi genocide in school, and many people here understand Nazis to be a powerful regime responsible for bringing Germany out of economic recession. Perhaps that is why Dhani himself was unrepentant when reporters questioned his choice of costume. Not that Dhani (who also hosts the TV show “Indonesian Idol”) is known for upstanding citizenship to begin with. When I brought up his name in the lunch room, my female colleagues hissed, “I hate that man; he cheated on his wife with her best friend!” Dhani is also known for handing car keys to his 13-year-old son, whose irresponsible driving left seven people dead on a Jakarta highway. No, Mr. Dhani, when your fashion explicitly mimics a historical figure and is used in an explicitly political forum, it cannot be de-linked from ideology, especially when genocide is a common thread. Prabowo himself is linked to several incidents that may qualify as massacres of civilians. He was discharged from the military for ordering the abduction of pro-democracy activists in 1998, and may have led some massacres during East Timor’s fight for Independence from Indonesia. Herein lies the difference between the two candidates. The campaign is the perpetual juxtaposition of the ideals of power, strength and authoritarian leadership, and those of participative, citizens’ democracy. Jokowi walks through the crowds of his supporters, shakes their hands and listens to them, wearing a common man’s checkered shirt. Prabowo rides past his supporters on horseback. Every Indonesian who has told me that they prefer Prabowo has used the words “strong man” in their description. They want a leader who will bring order and get things done, even if that means sacrificing human or civil rights. (Very few people care about Prabowo’s human-rights record.) Most of these people long for some part of Indonesia’s past which they viewed as more orderly and prosperous (a time when dissent was met with violence). Those who prefer Jokowi tell me they need a new Indonesia, one that breaks with the past and where their voices are heard. In total contrast to the pro-Prabowo video, a handful of popular Indonesian artists incorporated the international symbol for peace in the “Two-finger Salute” video, promoting Jokowi’s ballot number, 2. The video which was released before Dhani’s, has an authentic everyday-Indonesia feel and features a group of friends at a typical warung (Indonesian eatery) at the end singing “two-finger salute, don’t forget to vote for Jokowi.” You may notice all of the smiles, so different from the stark aggression of the pro-Prabowo video. Difficult as it may be to believe, the race is incredibly close. Prabowo has closed the poll gap from a few months ago, which Jokowi lead by a wide margin, to surpass his opponent in many polls. With the election just a few weeks away, we are all watching with anticipation and awe as the campaign unfolds. In May, I had the opportunity to explore the importance of forests. No, I didn’t go on a hiking trip. I spent some time at, and wrote about, the Center for International Forestry Research (CIFOR)’s Forests Asia Summit, a conference that brought together international experts from around Southeast Asia, where deforestation is a persistent problem. I love forests. I love hiking in them and I love living near them (two things that are very difficult to do from Jakarta), but I don’t always think about the amazing role forests play for humans and the planet. We’re often told that forests are the planet’s built-in cooling system (an admittedly important role as we face climate change), but that is only part of it. Forests are key for our food systems and our economy. Forests are a pantry for the world’s poor, and an incubator for biodiversity and unknown genetic material that could lead to vital scientific discoveries. Even those of us who think we live in urban environments may be more dependent on forests than we realize. Forests and agriculture have an important symbiotic relationship. For example, at one panel discussion, I learned that in Asia, about 80 percent of food crop plants are pollinated by insects that live primarily in forests. Forests also help control the land erosion, water retention and other factors that are key for successful agriculture. In addition, farmers around the world have historically used forests as part of their farming — for example, in India, farmers gather leaf litter to improve the compost they use to fertilize their fields. 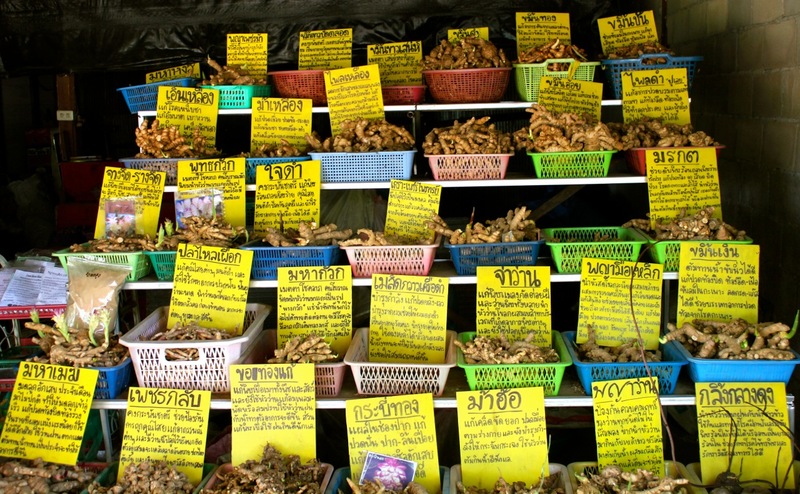 In rural Thailand, roots foraged from nearby forests are sold for food and medicinal use. Forests are also a key source of food for many people. CIFOR recently released research showing that children who lived in areas with higher tree cover had more nutritious diets, largely because of the diversity of products that families harvested from the forest such as tree fruits, small animals or insects. Think about the origin of those mushrooms in your ravioli, or the bamboo shoots in your Chinese takeout. Those are forest foods, and for some people, the nutrients they provide are essential for survival. 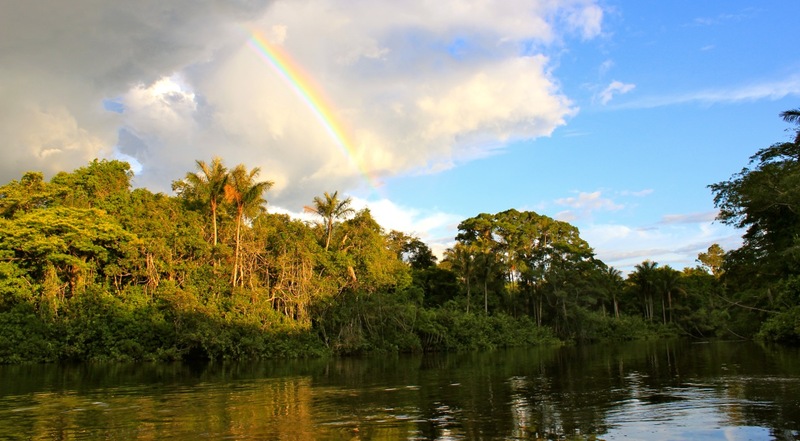 Food products are not the only valuable commodities coming out of forests. While 14 million people are employed in the forestry sector, many more depend on forests for their livelihoods. This includes not only timber extraction, but also valuable, non-timber forest products, such as bamboo. Sure, when you think of bamboo, you may think of shantytowns — as bamboo is an inexpensive construction material. But the product actually has “enormous potential” for mitigating and adapting to climate change, according to Rajendra Pachauri, the chairman of the Intergovernmental Panel on Climate Change (IPCC). Bamboo, which grows back much more quickly than hardwoods and can be harvested without degrading a forest ecosystem, can be used to replace materials such as plastics and metals that rely on primary resource extraction. Next time you think of beautiful wood flooring, think of bamboo. Most amazingly, I learned that much of the value of forests for our planet and ourselves remains largely unknown and undocumented. Trees have evolved into some of the most genetically variable organisms on Earth, with implications for the provision of unique genetic material for scientific research. Research can lead the development of new varieties of tree fruits that are more nutritious, resistant to pests and commercially valuable, or to discoveries in medicinal properties of trees, among others. The Food and Agriculture Organization (FAO) of the UN is doing important work to document these genetic resources, and released a report about it in May. These are only a few of the highlights that left me so inspired about forests, and so devastated to learn that in Southeast Asia alone, an area three times the size of Jakarta is stripped of its trees every month (and trust me, Jakarta is huge). If you want more information about these topics or the Forests Asia Summit itself, then Forests News is the place to go. When we set out to build our life together abroad, we thought of ourselves embarking on an adventure in foreign lands; we’ve evolved. 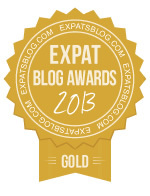 At the same time, we think this blog has evolved. Rather than a personal newsletter, it has become a forum for sharing current events, and discussing interesting cross-cultural issues from our perspective. We wanted to adopt a name that more accurately reflects this experience. So we’ve decided to change our URL, and make the site more inviting for people we have not yet met. 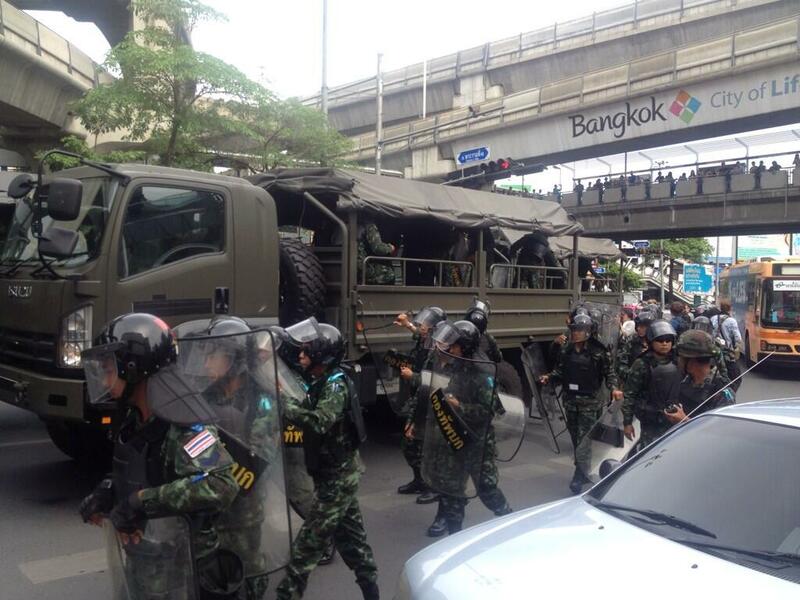 What would it be like if Thailand’s military coup were happening in New York City instead of Bangkok? If you know Manhattan, imagine opening the Sunday paper to read that as of 9, am all subway stops between Houston and 42nd Street would be closed, because the military government had heard rumors of protest plans. All the stores in that area would close as well. Local street vendors would be cleared out. The area would be flooded with troops (thousands of them) and the government would urge people to avoid the area. That is more or less what happened today in Bangkok’s central shopping district, an area with several giant, hyper-modern malls surrounding a few elegant plazas, decked out with larger than life video-billboards — places that normally teem with public life. Three stops of the Bangkok Transit System sky-train were shut down. Instead, every entrance to the stations – which are also used as public pedestrian walkways – were blocked by with armed military in riot gear. Very small protests emerged and then scattered, only to reconvene elsewhere, mostly avoiding arrest. With around 20 people, they were a strange contrast to the hundreds of uniformed men they opposed. The threat of dissent, however, succeeded in reducing profits for the malls. When those small protests popped up, they also adopted a new trend: a three-fingered salute, referencing the movie “The Hunger Games.” The Thai Free news said over Twitter that the three fingers stand for liberty, equality and fraternity. Whatever its origin, the salute emerged today as a new anti-coup symbol, being adopted by the United Front for Democracy Against Dictatorship (UDD)’s Twitter feed. Political gatherings of more than five people have been banned by the coup leadership. The military have also shut down radio stations that tended to favor the government, and recently ordered that any red flag be replaced with the national flag. In some parts of Thailand the red flag is flown to show political support for the UDD, which was recently ousted from Government by the coup. International news channels, CNN and BBC are still blocked in local television service. As I will be leaving Bangkok this week, I will not post anymore about my experience in the land of coups. But I will continue to follow the situation and reference any interesting developments in this blog. 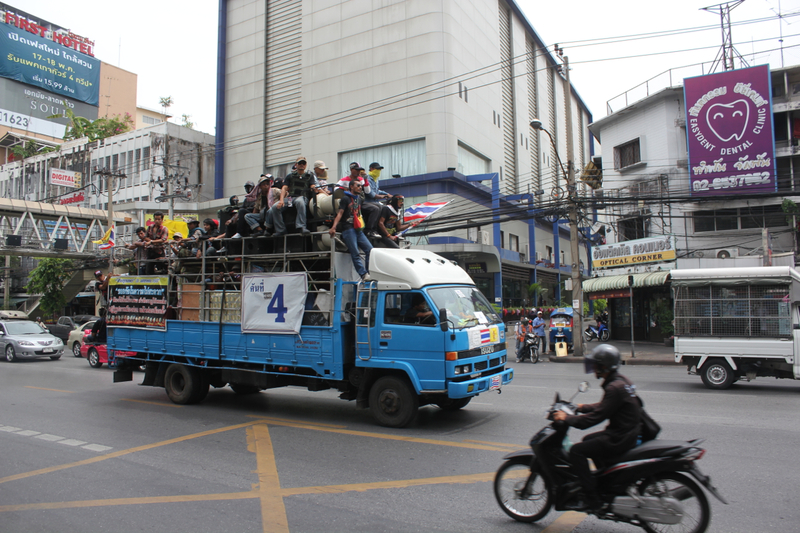 A truck full of protesters barrels through a major street in downtown Bangkok a few days before the military coup in Thailand. The leaders of the military coup under way in Thailand shortened a nationwide curfew, doled out payments to rice farms, and cracked down more strictly on freedom of speech today. The leadership seems to be trying to soften their image while simultaneously tightening their grip on the country. On Tuesday, coup leaders began transferring payments to rice farmers that the government had failed to pay earlier this year as part of a national rice-buying system. That same day, the military arrested the Minister of Education for speaking out against the coup. Today, the curfew — which previously restricted anyone from being out in public between 10:00 pm and 5:00 am — was shortened to 12:00-4:00 am. Facebook was temporarily blocked for Thai users, and the military summoned two reporters for asking tough questions of the leading army general. Strolling the streets near my hotel in Bangkok, you might not even notice political strife; no military personnel line the streets in this area of town, workers and shoppers go about their business normally, just as coup leaders encourage them to do. But the signs are still here (literally): a giant poster in Thai warns that defaming the king on social media could land you in prison. From my hotel room I tried to access an online story about Thais who dislike the royal family, and what I received was a blank page with the text, “This URL has been blocked by a Court order or it could have an effect on or be against the security of the Kingdom, public order or good morals.” As peaceful as life here seems on the surface, there is no mistake that freedoms in Thailand are still heavily curtailed. The question of how to describe the coup is becoming ever more confusing. One local paper called the coup leader, General Prayuth, a benevolent dictator, and “the perfect man for the role,” suggesting this is just what the country needs. At the same time, the Financial Times editorialized that that Prayuth has “imposed a brutal dictatorship that has snuffed out freedom of expression and civil liberties.” Teasing out the truth is complicated, but a danger lies in the growing divide and polarization that the coup may cause. “For most Thais there is no middle ground; protesters have no time for a truth that lies between black or white, or in this case Red or Yellow,” according to Nick Nostitz, a German photojournalist who has followed the conflict closely for decades. Military control may either foment greater outrage or silence dissent; the outcome is unfolding before us. 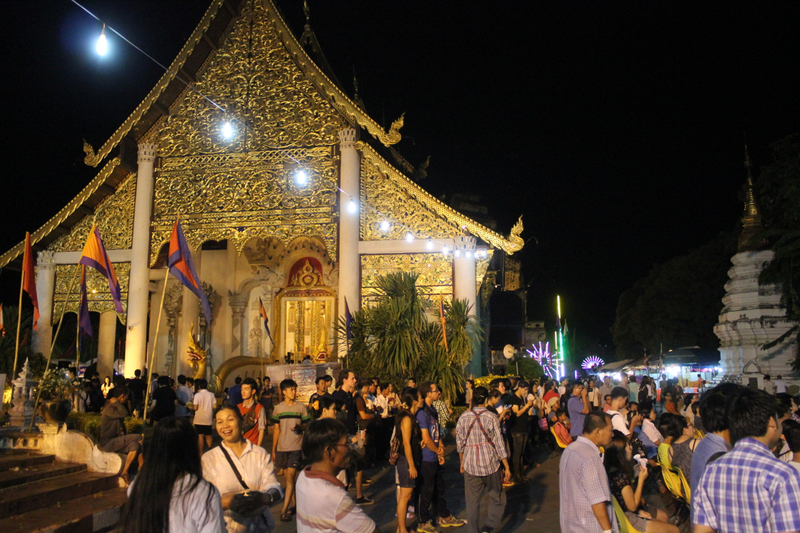 Revelers at the Wat Chedi Luang in Chiang Mai, Thailand, on 25 May, 9:50 pm, 10 minutes before the military curfew took effect. 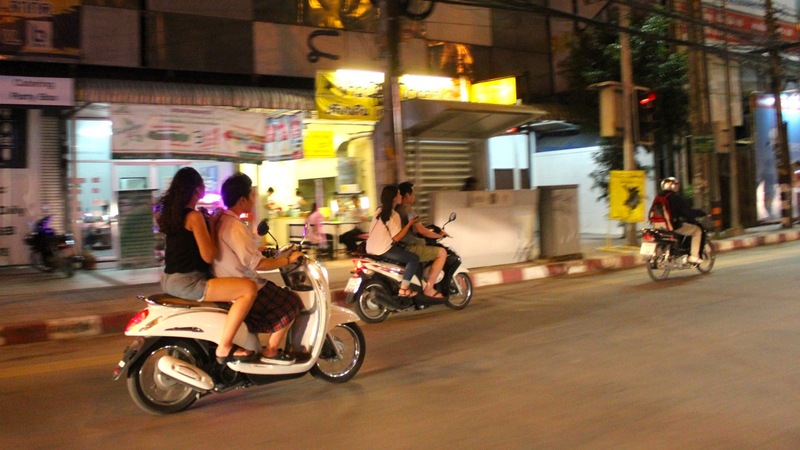 In Chiang Mai, Thailand, locals butted up against the military-imposed curfew, partying until after 10pm as part of an annual city festival. The Inthakin festival is held in mid-May, to ask the spiritual guardian of the city to bring monsoon rains on time, normally rages late into the night. On Sunday, May 25, about 5 minutes before the 10:00 pm curfew imposed nationwide by the military coup, the party suddenly ceased. The ferris wheel stopped spinning, the music stopped playing and the streets slowly began to clear out. Even after 10:00, though, revelers continued to munch on street food; 7-11 continued to sell icy beverages to the throngs of shoppers filing through its doors; at the temple grounds, the pious continued to toss flowers around a golden statue of Buddha. The Inthakin festival centers around Wat Chedi Luang, the temple grounds that also house the city pillar, which locals believe was given to the city by a god over 1,000 years ago. During the full first day of the eight-day festival, residents of the city come to pay homage at Chedi Luang by giving donations and decorating the key symbols of the temple with flowers that they line up to buy at the temple gates. The annual celebration normally engulfs the adjacent city blocks, with food vendors lining the streets and a carnival exploding in a lot near the temple. Several city blocks overflow with people, and erupt with pulsating music, colorful lights, and the complex smells of smoky street food, late into the night. This year, the festival began 3 days into a military coup that is tightening its grip to silence protests. Earlier that same day the military replaced the Chiang Mai Police chief, and also broke up small anti-coup protests in another area of the city. Soldiers in army fatigues carrying machine guns patrolled the streets of the city, but seemed to avoid the area where the Inthakin festival was underway. Revelers continued after the end of the curfew, but the military did not intervene.